In the world there are all sorts of prisms to be found all over the place. You've got your dispersive prisms, your reflective prisms, and your polarizing prisms. 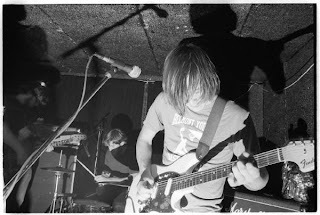 But your best bet, if you wanna find awesome prisms, is to look to San Francisco's Young Prisms and their glorious muddle of 60s psych and salacious shoegaze fuzz. I had wanted to see this band for so very long, and circumstances had always prevented me from getting my Young Prisms adulation on. Thankfully, the drought is now over, and I have nothing but niceties to transmit to you about my first live YP experience. Naturally, I already approved of the band, seeing as half their number was sporting well-manicured beardage. But aside from the awesome facial hair, the band instantaneously got under my skin something fierce. Their kaleidoscopic loveliness, their prismatic jangle, their frenetic meets chilled fuzzery just all became sonic salve on a savage Monday. I was reminded during their set of the Isn't Anything record of My Bloody Valentine, and am pretty sure it lurks in at least one Young Prisms' record collection. Sheildsian guitar was only one piece of the Young Prisms live onslaught. Daydreamy, blown-dandelion vocals and a fierce rhythm section also contribute mightly to why this is such a great little live band. Their dynamite combination of beachy pop sensibilities and the dirty scuzz of MBVesque shoegaze makes me oh so happy. They also get bonus points for a) threatening to play "Kiss from a Rose" as their last song and b) not following through on that particular threat. It might have been a longish time coming, but my first Young Prisms experience was a blissful time indeed. Now it's inevitably time to wonder when I'll get my next fix. It better be soon, and if y'all have sense you'll be there with me. Young Prisms "Sugar" from kay kanine on Vimeo.